Math Rap Level Two is a fun, effective way for students to master their multiplication and division facts. The first 10 songs on the CD cover the multiplication facts from 1 to 10. The next 10 songs cover division facts from 1 to 10. The two final songs teach basic geometry and how to add fractions. All the songs feature important content-area vocabulary. The Teacher Resource Book features lesson plans, answer keys and classroom games. 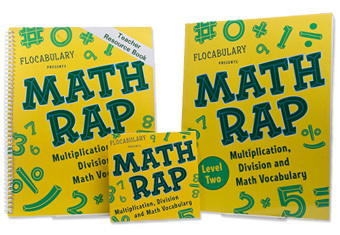 Unlike other “multiplication raps,” the songs on Math Rap Level Two are performed by professional rappers, so the music sounds like what students hear on the radio. This title was previously known simply as Math Rap. The content of the program has not changed. Do you, do you know your twos? Yeah, I know my twos.